Ryan Kent (right) has been in impressive form for Rangers. 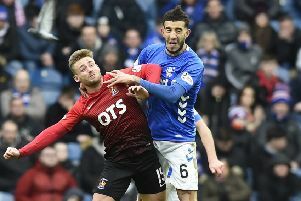 Pic by PA.
His stunning strike at Parkhead last month was a rare moment of joy for the Light Blues as they suffered at the hands of their old rivals but McCoist believes it will also have delighted Liverpool, who can now expect a bumper windfall should they decide to cash in the 22-year-old at the end of the season. The club’s all-time record goalscorer - speaking at Ayr Racecourse as he promoted this weekend’s Coral Scottish Grand National - said: “Kent has been fabulous this season. “However, it looks like another loan deal is the only way it could happen. “The number of goals he has scored this year has been great and some of his performances have been fantastic - but he clearly has a discipline problem. Steven knows that. “Watching his interview after the Celtic game, I could sympathise with him because I knew where he was. “It’s now time for Alfredo Morelos to take responsibility for his own actions. 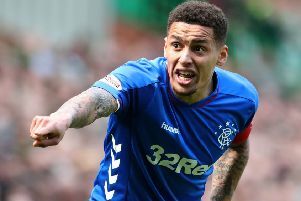 “If he hasn’t learned from his mistakes - particularly the one in the Old Firm game - then there is probably no chance for him.